With the advent of the digital camera that can take video, all sorts of things are now recorded. Here, the secrets of the lab and its occupants are revealed. 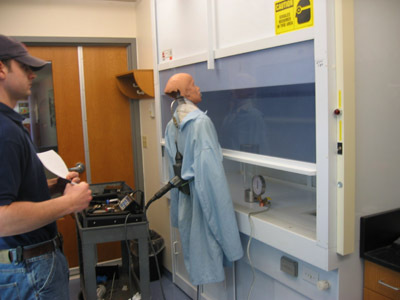 In the image above, a real dummy sniffs the air for the aroma of SF6 during an ASHRAE 110 test of the older Microzone hoods that have now been removed from the lab; this image was taken in the now-relocated radiogenic lab.